It was a battle of the bots in my apartment this week. Google Home, the voice-assistant smart speaker Google (GOOGL) debuted last month, officially launched on Thursday. With years of search data collection under its belt, Google is poised -- in theory -- to take on the Amazon Echo and become a remote control for your life. But before we start calling it an Echo killer, let's take a close look at how it actually handles voice and service commands. I tried the small round speaker in various rooms throughout my home -- one that's already become used to the superb Echo and its built-in assistant, Alexa. Out of the box, Google Home is a solid home accessory for those who want to control apps and services with their voice. Its voice assistant, appropriately called Google Assistant, responds to the trigger word "OK, Google." And at $129, the gadget is significantly cheaper than the $180 Echo. 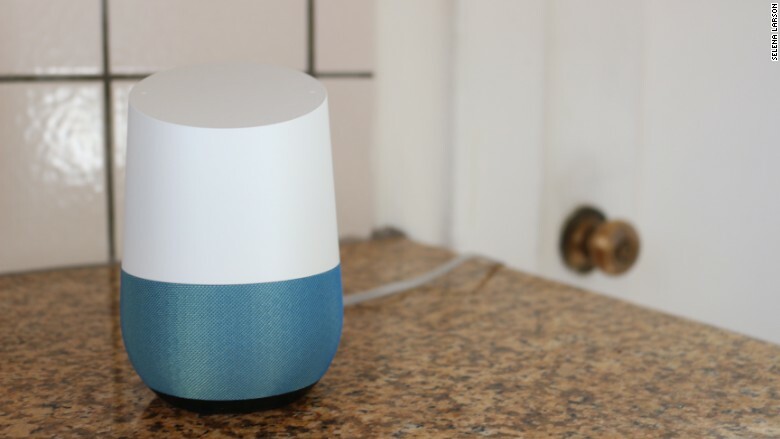 Like the Echo, Google Home connects to your home Wi-Fi, while a companion app saves and displays your searches or queries. I had difficulty connecting Chromecast, Google's streaming dongle, and my calendar to the Home app, but eventually got it set up correctly in the kitchen. Google's device gave recipes for baked chicken, read the news to me from NPR and played my Spotify Discover playlist. While it fit nicely in a corner, the cord was a bit of an eyesore with limited counter space. But it wasn't exactly the game changer I expected. Frequently, the assistant's response to my questions and commands were met with the following: "I don't know how to help with that yet, but I'm still learning." 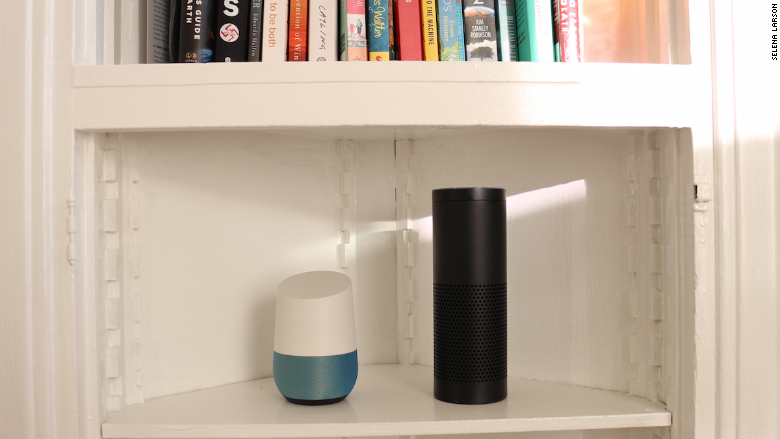 In fact, Google Home has a bit of catching up to do with the Echo, which has been on the market for two years. Both devices successfully told me facts about President Barack Obama when asked, but only Amazon's device provided the Rangers score in real time. A follow-up question about the World Series turned up empty with Google Home; Echo gave the date and start times to the next game. This was disappointing considering Google's robust search engine -- after all, the Echo relies on Bing, widely regarded as an inferior search engine. It's key to remember Google Assistant is still a nascent product with limited third-party apps. This is an area where the Echo already excels, thanks to thousands of "skills" and app integrations. Google's repertoire of early partners include Uber -- allowing you to call up a car via a voice request -- as well as music Spotify and Pandora. It also lets you control smart products in the home, such as Nest thermostats and Philips Hue light bulbs. 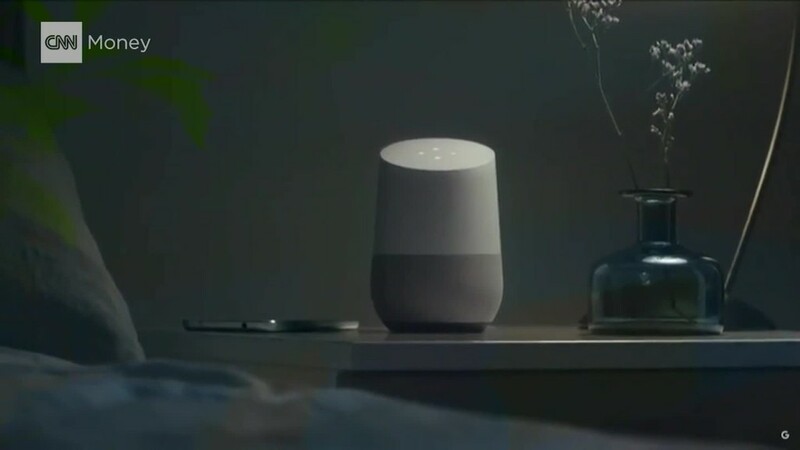 When Google Home debuted last month, Rishi Chandra, vice president of product management for Home products, said he anticipates Google Assistant being as big or bigger than Android, the company's mobile operating system. "Once we open this up, we're very good at building developer ecosystems," he said. "[When] we have real momentum, the scale Google can bring is so unique that we will have tons of people participating." Google Assistant's Actions on Google program will open up to developers in December. As a speaker itself, Google Home struggled to hear and understand my commands. I often had to repeat myself and shout at the device. In contrast, Echo responds even when I'm in another room. But the audio quality on both is similar and adequate. If you're looking for top-shelf sound for blasting your favorite tunes, you're better off using bluetooth speakers like Sonos. While the Amazon Echo has an edge up on Home for now -- you can even buy items from Amazon directly via your voice -- Google has a better grasp on languages. When asked to translate the word "hello" to Spanish, Google Home responded correctly. Although Alexa could not pronounce it, it wrote out translation in the Alexa app. Once Google Assistant learns commands and connects to more services, it will be a forceful competitor to Amazon's Echo. For now, it has a bit more growing to do. It's also important for buyers to consider which ecosystem they want to be a part of. If you're already entrenched in Google services, Google Home might be more appealing. But for frequent Amazon shoppers, the Echo is your obvious choice.